Hanging with Samoeun Sothyro last week left me inspired and hopeful. 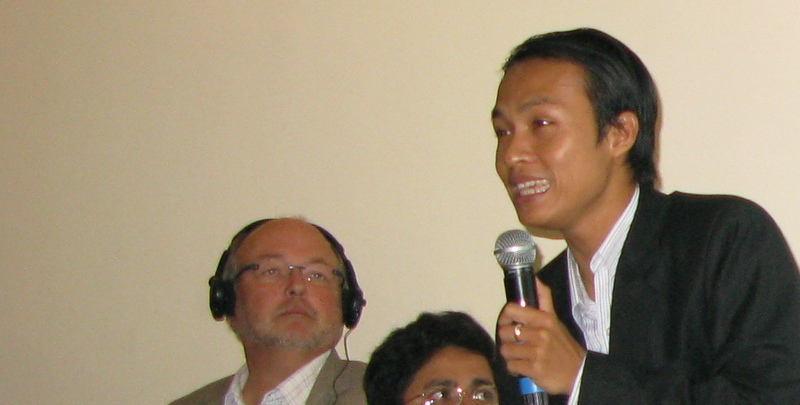 Sothyro is is the communications manager at a small environmental NGO in Phnom Penh. He’s also the guy charged with building an online knowledge sharing network amongst IDRC-backed research organizations in Cambodia. These are groups working on everything from natural resource management to human rights law to community internet access. It’s not an easy gig. Sothyro and I met with about 15 of these orgs early this year. While they all had vision and excitement about swapping information, most also felt succeeding online wasn’t going to be easy. In the months since these meetings, Sothyro has rallied support and convinced people they get there if they just focus on simple things. One of the big barriers in Cambodia remains good, affordable Internet access — even in Phnom Penh. A basic, shared access 1 megabit office connection is $US1200+ a month. This is slower than my cable modem in Toronto and 20 times the price. Along with some colleagues, Sothyro has started talking to ISPs about getting deep discounts if all the members of his buy as a block. I joined him on a few ISP meetings while in Cambodia last week, and it looks like the idea may get traction. If it does, it’s an immediate ‘let’s use the internet more’ win for the research network partners. Why was I inspired? Because here’s a guy in a place where people are skeptical about the possibility of getting stuff done on online (and with good reason), and he’s just running ahead and doing it with passion. It’s energizing to be around people like this and see them move. Go, Sothyro! And lemme know if you need any help along the way. PS. This is the last trip I will be doing for IDRC for quite a long while, I suspect. End of an era. Strange. Over the past six months, alot of people have asked me ‘how’s it going with telecentre.org?’ My response has typically been: ‘Ah, umm, okay. I think.’ 2007 was a year of change and uncertainty. My answer changed to ‘telecentre.org is rockin’ the house’ this week as I hung with the whole team in Valparaiso. This team is focused on concrete action that can truly help telecentres: a global telecentre.org training academy; a venture fund that will help telecentre networks and their members become successful social enterprises; a research program that will dig deep into the social and economic impact of public access computing. Also, there is new and strong communications team in place to capture and share stories of what is happening across the telecentre movement. Florencio has done a great job rebuilding this team, and they are moving fast. Being at the team meeting also reminded me how much the telecentre.org community has achieved in the past three years. There are existing and emerging telecentre networks in almost 50 countries. There are strong grassroots leaders who are spreading the telecentre.org ethos on every continent. And, most importantly of all, the whole conversation about telecentres has shifted from ‘this is a dying idea’ to ‘this is a social entrepreneurial spark that’s about to catch fire’. While there is lots more concrete work to do, the telecentre movement has come a long way in the last few years. From my side, I’ve made a commitment to work with the telecentre.org team for at least another year. My main job will be to focus on social enterprise development, with most of my time going into the creation of a small (and probably single-region) social venture fund to help networks develop into product and service channels. I will also continue to work on the development of new global partnerships. It was a pleasure to hang with the whole telecentre.org crew again. They’ve got the tunes cranked and they are rockin’ the house in a big way. It’s a party worth watching, and joining. While in Cambodia last week, I spent two wonderful days visiting telecentres and network hubs run by the iReach project. The idea behind iReach is to create 10 telecentres in two rural areas all connected to each other by wireless broadband (10mb/sec). One of the sites has a mediumband satellite Internet connection which is then shared across all the sites. However, the Internet is not the main point. Rather, the idea is to do broadband sharing within the 10 villages, which can be up to 20 kilometres apart. The idea is a brilliant: connect people locally using the best and fastest technology, and leave the Internet as an afterthought. The people running the two iReach pilots are already thinking of interesting ways to make this useful. Podcasts of local people talking about local issues beamed via the network to loudspeakers outside of local pagodas. Video conferences to teach English. Cooperation amongst local committee members democratically managing the project. There are difficulties, but things like this are happening (or about to happen). However, it also feels like there is still a ton of untapped potential. These networks could provide an excellent channel for NGOs (or even the government?) who say they want to reach out and work with communities like these. The people and technology are in place to offer education, health care, government services and anything else imaginable to these communities, at least in part. There is also potential for interesting new business models, like the VillageTelco idea Steve Song is playing with. The next challenge for the iReach project will be to show people who say they want to reach out to these communities how the network can help make things like these happen. My sense is they are ready for this. A side note, which really should be its own story: I was super impressed by the role that the Maharishi Vedic University. This institution is acting as the lead for the iReach project in Kamshai Mear. They oversee the project, have helped build to local management committee and have sourced many of the staff. What’s impressive is how their combination of community development plus Bhuddist spirituality have given the project such a firm footing. All of the people we met and content we saw was very much *of* the communities being served. Example: an video promoting schoold enrollment with actors from the local management committee and villages. It’s hard to describe, but it felt alot like Sarvodaya meets Challenge for Change. Quite impressive, and likely to be a good mix with the local hitech / broadband model. Barcelona, Spain. June 19+20. Earlier this week, about 40 people gathered in Barcelona to talk about ‘e-skills and employability’. In many ways, this was a typical telecentre.org meeting. Everyone attending – including host organization Fundación Esplai – was in the business of running telecentres or other community technology projects. The event helped them build new friendships, learn skills and practices from each other and, in some cases, surface opportunities to work together. However, one thing this meeting was different. The common touch point was not just the telecentres, but also a commitment to using technology to help people get jobs or start businesses. It seems that this message is being heard, especially by the EU and Microsoft people who were at the event. A new social market is emerging and these community tech NGOs are moving in shape it and take advantage of it. That’s a good thing. However, I don’t think it is the most interesting thing. What’s more interesting is that almost all the community tech organizations at the Barcelona event saw ‘jobs and employment’ as part of a broader poverty fighting | social justice | empowerment agenda. On day one, we did a spectrogram exercise on the statement ‘eskills is the most important issue that my organization works on’. The bulk of people ended up on the middle of the line, saying that providing computer skills isn’t simply about helping people get a job. It’s also about creating a sense of confidence, an opportunity for self expression and a chance to shape and bend the world around you. This is what sets computer skills apart. This holistic perspective is pretty typical of telecentre and community technology people around the world. They are in this game because they believe that offering access to technology offers a way engage people on a broad social change and empowerment agenda. It’s no wonder that some of the best telecentre projects come from large scale, well rooted movement organizations like Sarvodaya and Esplai. In the end, this is a great strength of the telecentre movement … a strength that grounds and deepens the kind of initiatives are likely to emerge around the EU e-skills and employability agenda. The sad thing – and the thing that was different about the Barcelona event – is that community tech organizations rarely communicate this broader agenda. They sound like they are just pushing access to technology and basic skills. And, when they do, they tend to talk in broad platitudes about things like ‘poverty reduction’. This is neither inspiring nor convincing. The upside of what’s happening in Europe is that community tech organizations are being forced to think and communicate about themselves in the context of very specific social markets and social change opportunities. Access, training or generalized statements about social impact are no longer enough to justify funding or other kinds of support. However, bringing 10+ years of socially focused tech service delivery experience to help Europe address the skills gap (and possibly to radicalize the debate in the process) is a very specific value proposition. It’s likely that these organizations can sustain their relevance for another 10 years if they can deliver on this value. There is a lesson in this for the global telecentre movement: experienced telecentre organizations have huge potential as platforms for policy makers and corporates who want to reach out to marginalized communities. This in turn has the potential to generating more value for communities and creating new revenue sources for telecentres. Seizing this opportunity is at once a matter of holding on to traditional telecentre movement values while at the same time being clearer and more specific about what these values have to offer to the world. Luckily, seizing this opportunity and communicating more clearly is not something that telecentres need to do alone. That’s the good part of belonging to a global movement. Delhi, May 2007. This past week I had the pleasure to be at a telecentre.org Training Commons meeting in Delhi. The Training Commons started about 18 months ago as an effort to encourage telecentre organizations in India to share the material they use to train new managers and coordinators at the village level. In the end, it evolved to become a much simpler attempt to create Telecentre Management Training Materials in five areas: grassroots marketing; entrepreneurship; infomediary skills; grassroots communication; and community development. These materials are being developed by a consortium that include NASSCOM Foundation, TaraHaat, World Corps, MSSRF and Plan International. It was great to be back in the conversation and to see the partners really working as a team. I found out that the first text versions of these materials are almost done (the meeting was a feedback and planning session). Once this is done, it looks like the partners themselves will use these materials and like the Indira Gandhi National Open University may build a program with these modules as a foundation. Also, the process itself has been notable: you really see a collective effort from organizations with very different ideas about telecentres. This is the kind of networking for concrete outcomes that telecentre.org needs to be doing more of. Colombo, Sri Lanka, April 2007. While I was in Sri Lanka, Sarvodaya launched it’s new Fusion program at HQ in Moratuwa. Watching the Fusion powerpoint, it was tempting to ask: what is this? In some ways it comes across as a mishmash of telecentres, e-agriculture activities and everything else under the sun. While can be confusing at first, it makes sense. Much of Fusion’s basic logic is built around the idea of rationalizing and accelerating all of Sarvodaya’s existing ICT4D efforts (telecentres, community outreach, training, wireless, content). Over the years,these things have all spread apart with different teams, managers and offices all over the Colombo area. It was time to rope them all in and then head off in a single direction. At the most simple level, this is what Fusion is doing. However, it is clear than Fusion is – or at least can be – much more when you take the time to sit with the whole team, as I did last Saturday. It really is a ‘fusion’ of ideas, programs and vision that is quite rare. You have people on the team who come from accounting and sales, technologists and tinkerers and community development activists who have worked in Sarvodaya for almost 20 years. Together, these people have the chance to mix together the wisdom from Sarvodaya’s history with the creativity, the power of new information technologies and opportunity of social enterprise ideas. In the immediate term, these folks may only merge Sarvodaya’s existing ICT programs (useful but not visionary). However, In the long run, I expect these people are going to create a current that will make people around the world pay attention. It’s worth saying that Fusion’s business plan (like the powerpoint) doesn’t yet tell the story of the people, networks and ground presence that sit behind Fusion. I have offered to help Harsha with this, helping to better describe these existing assets and looking at future products … and generally to make the plan less NGOish. Moratuwa, Sri Lanka, April 2007. “You should be talking about sustainability, not social enterprise.” Those were Rich Fuchs’ words very early on in our discussion about the telecentre.org SustainabilityFirst! report, a plan invest in social enterprises that offer revenue generating services via telecentres (giving the telecentres a cut). The aim of the discussion was to finalize how telecentre.org would roll out this global fund. In the end, we (Floro, Harsha, Loic, Eva and Rich) decided to tear up the document and start over. It’s not that the analysis in the document was wrong. There is in fact a huge opportunity for both sustainability and public good in the telecentre services space. Think of what telecentres could do if they had access to a menu of health, education and government services that they could easily offer to their communities for a small fee? Rather, the insight we came to was that a new ‘fund’ targeting a dozen or so social enterprises would not likely be enough to really build momentum in the services space. Also, we felt the fund represented a ‘grow’ (distraction) approach. We need to ‘deepen’ (our new mantra of nurturing and strengthening our existing network partners). So, we asked ourselves: how can we push the sustainability and services envelopes through our existing networks? At least part of the answer was right in front of us at Sarvodaya. Harsha’s team had recently been approached by a number of local companies with services to offer through telecentres. And, as the lead for the Sri Lanka Telecentre Family, this team was also working with NESST to develop a new set of digital skills courses to be offered for a fee through both Nenasalas and telecentres. This mashup of opportunistic partnership development, rigorous business planning and business coaching for key team members looks like it will allow Fusion / Sarvodaya / SLTF not only to help its partners become sustainable but also to become sustainable itself. Based on this observation, we resurrected the SustainabilityFirst! moniker and came up with a new collection of activities aimed at helping our network partners become ‘sustainability channels’. This will include a mix of capacity building and mentoring for key ‘sustainability activists’ in our partner networks as well very small as needed grant funds and a community of practice connecting these activists together. We will start developing a concrete plan on this in the coming weeks. You are currently browsing the telecentres category at commonspace.